Issues of pollution and natural resource exploitation are often symptoms of much larger societal concerns such as livelihood instability, food insecurity, poverty and overpopulation, to name but a few. Such threats to our environment are further exacerbated by two basic facts: (1) that the natural resources and ecosystem services provided by nature have many competing uses and users; and (2) that the threats to forests, rivers, lakes, mangroves and coastal areas, urban settlements, agricultural lands, and other ecosystems and land use types, all being part of much larger ecosystems, affect neighboring environments at varying degrees making many environmental concerns transboundary in nature. The land thematic group discussing the issues related to the governance of land resources. 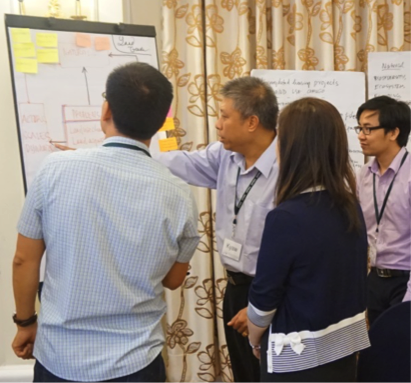 Recognizing that many environmental problems are “wicked” and should therefore by approach using a more holistic perspective, the Economy and Environment Program for Southeast Asia (EEPSEA) held a course on “Transdisciplinary Research for Natural Resources Sustainability” on December 7 to 10, 2016 in Ho Chi Minh City, Vietnam. The course was attended by 30 participants representing eight countries in Southeast Asia, namely Cambodia, Indonesia, Lao PDR, Malaysia, Myanmar, Philippines, Thailand, and Vietnam. The participants included researcher from a variety of disciplinary backgrounds based in universities or representing government agencies tasked with environmental and natural resource management. Dr. Svein Jentoft of the University of Tromsø in Norway and Dr. Ratana Chuenpagdee of the Memorial University in Canada served as the course resource persons. Drawing from their past experience and as part of the transdisciplinary research network Too Big To Ignore (TBTI), the resource persons helped the participants better appreciate the underlying principles of transdisciplinary research. Lectures on the theory behind “wicked” problem solving, holistic thinking, and interactive governance were supported by group activities that allowed the participants to gain a better grasp of these abstract concepts. To allow the participants to better process the concept of a “wicked problem”, they were grouped according to the natural resource they mainly work in. Four thematic groups emerged: forest, water, fish, and land. Each group was asked to identify the main issues, concerns, threats, and problems within each resource and to identify which of these are “wicked” problems and which have technical solutions. Research problems are often framed using one disciplinary standpoint. However, logic and experience dictate that “wicked” problems—usually resulting from the interaction of natural, social, and governing systems and thereby having no easy-fix technical solution—cannot and should not be viewed as being within the domain of only one discipline. Such problems require a more holistic approach in order to “tame” them. Hence, the initial lectures of the course focused on expanding on the need for a transdisciplinary perspective when addressing “wicked” problems. The involvement of various disciplinary perspectives and stakeholders in the research process so as not to have a limited perception of what the problem is was underscored. The training group went on a trip to Saigon River during which each of the four thematic groups formed was asked to evaluate the applicability of the issues, concerns, threats, and problems they had identified to the river. After the trip, each group prepared a case study description of the Saigon River using their thematic perspective. The boat tour made evident the damages suffered by the river as a direct result of urbanization and overpopulation, similar to those suffered by many other rivers around the world. From top left, clockwise: Dredging activities along the Saigon river; solid waste dumping along the river bank, which are carried into the water during high tide; and real estate developments along the coast. The water group identified the following issues: (1) low water quality caused by solid and wastewater pollution and siltation, which has in turn lowered the river’s ecosystem function; (2) soil degradation caused by sand mining/dredging activities that are conducted to ensure the river’s continued use as the home of Saigon Port; and (3) streambank erosion given the land use change along the banks of the river—from mangroves to rice fields, and now to real estate developments. The forest group identified the following issues: (1) loss of mangrove forests along the Ho Chi Minh stretch of the river having been replaced first by rice fields and currently by real estate developments, which has then led to stream bank erosion, habitat and biodiversity loss, and the displacement of local farmers; and (2) siltation, evident because of the dredging activities in the river and which is assumed to be caused to some degree by upstream soil erosion, which may in turn be caused by upland forest loss; and (3) conflicting governance policies wherein local policymakers are overpowered by national policymakers who are pro-real estate development regardless of the local perspective that further development along the banks may affect the environment negatively in the long term. The land group identified the following issues: (1) land use change primarily because of urbanization, and which has led to biodiversity and ecosystem service loss; (2) land acquisition by rich “outsiders”, which has displaced many local livelihoods; (3) land subsidence caused by the expansion of urban areas, land slide, streambank erosion, and flooding; (4) land pollution from domestic sources and from shipping. The fish group identified the following issues: (1) fish population decline as a result of habitat degradation caused by water pollution and change in ecosystem; (2) marginalization of fishing communities; and (3) replacement of the once thriving fishing industry with other economic activities such as tourism, transport, retail, and sand mining, among others. Having been based only on the ocular visit and some background information provided by the tour guide and the Vietnamese training participants, the issues described above are very general, and therefore limited. However, the river tour provided the participants with a common case to discuss, and allowed them to better appreciate the abstract concepts presented during the course lectures, especially with regards to the concept of interactive governance. The relevance of a transdisciplinary perspective in governance was underscored during the training. Given that threats to ecosystems result from the interplay of the natural, social, and governing systems, a holistic approach in understanding the governability of the system-to-be-governed” is believed to be more appropriate than the usual disciplinary perspective. Hence, transdisciplinary research, with its various disciplinary perspectives and stakeholders, paves the way for a more interactive kind of governance. The course ended with the participants discussing the level of “wickedness” of the Saigon River problem and how they would tackle it through transdisciplinary research. Responses varied from focusing on the river’s water pollution issue to measuring the river’s governability. The importance of framing the research problem with a good narrative of the issues that the transdisciplinary research aims to tackle was emphasized. The resource persons further expounded on this using TBTI’s experience, especially the network’s five main research questions, which had taken two years to define. The role of innovation in the way problems are framed, in research techniques, and in the technologies developed to answer the problem at hand were also emphasized during the discussion. Such innovation is expected to result from transcending disciplinary boundaries towards a more holistic approach.